Some months ago while passing through Waco, Texas on a business related road trip, I couldn’t help but think about some of the historic events surrounding this small city named after Native Americans who once lived in the area. One of the most significant of these events is that Waco is the birth place of America’s third most popular soft drink, Dr Pepper, and home of the Dr Pepper Museum, housed in the 1906 Artesian Mfg. and Bottling Company building. 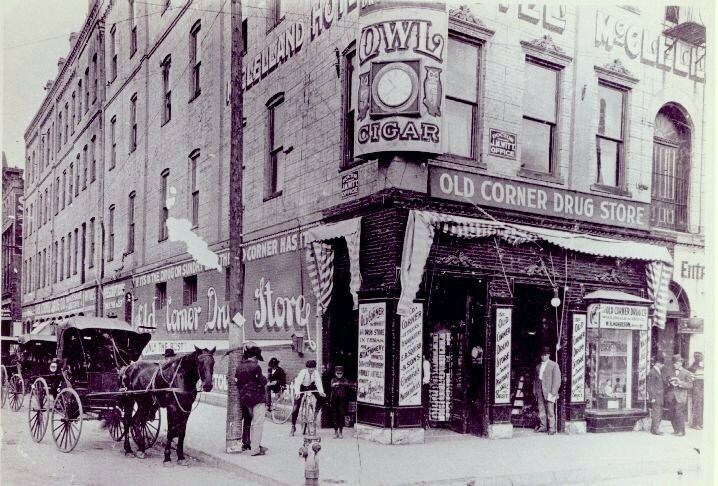 In 1885, a young Englishman named Charles Alderton was a pharmacist at Wade Morrison’s Old Country Drug Store, located on the northeast corner of Fourth Street and Austin Avenue in Waco. When not filling prescriptions, Alderton served soda fountain soft drinks to Morrison’s customers. Listening to his patrons express their boredom with the fruit flavors available at that time, him was inspired to create something new and different. After considerable experimentation Alderton finally came up with a flavor he was happy with. To test his new drink, Alderton first offered it to Morrison and a few select patrons, all of whom decreed it a success. Word quickly spread of Morrison’s new fountain drink and because it had no name, customers began asking for a “Waco.” And although Alderton created the beverage, it was Morrison who finally named it Dr. Pepper (the period was dropped in 1950) in tribute to Charles Pepper, the Virginia physician who gave him his first job, and whose daughter he loved. 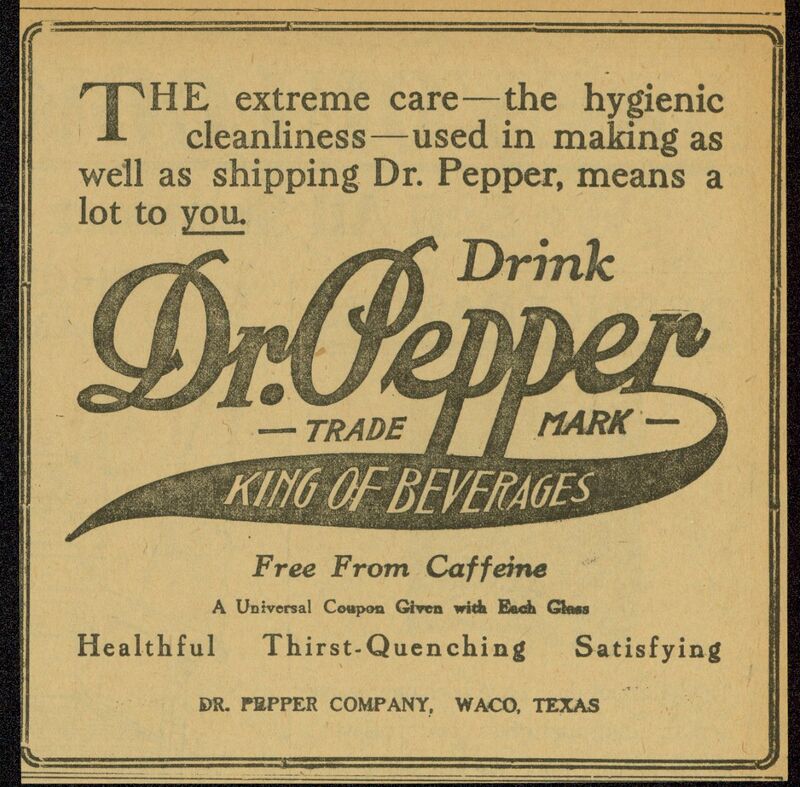 Soon demand for Dr Pepper around the Waco area became such that other drug stores and soda fountains began asking to buy the syrup from Alderton and Morrison. Eventually sales became greater than the small pharmacy’s production capabilities and a search began for a facility in which to manufacture the syrup. Robert Lazenby, a Waco beverage chemist and owner of The Circle “A” Ginger Ale Company, liked Morrison’s new drink and offered to produce Dr Pepper syrup in his bottling plant. Then in 1886, Morrison and Lazenby decided to formalize their partnership and formed The Artesian Mfg. 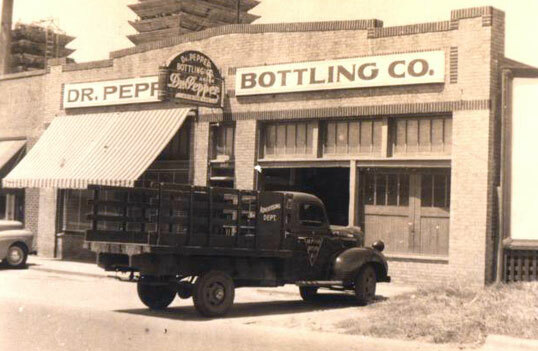 and Bottling Works to produce Dr Pepper in the Codd internal ball stoppered bottles. History tells us that Alderton, the beverage’s inventor, had no interest in further development of the soft drink and gave Morrison the rights to his formula, suggesting Morrison and Lazenby proceed without him. Alderton happily continued his work in the pharmacy until well into his eighties. In 1981, Texas businessman Sam Houston Prim tasted Morrison’s new fountain drink and right away he knew he wanted to sell it through his company, Dublin Bottling Works, some 80 miles west of Waco. 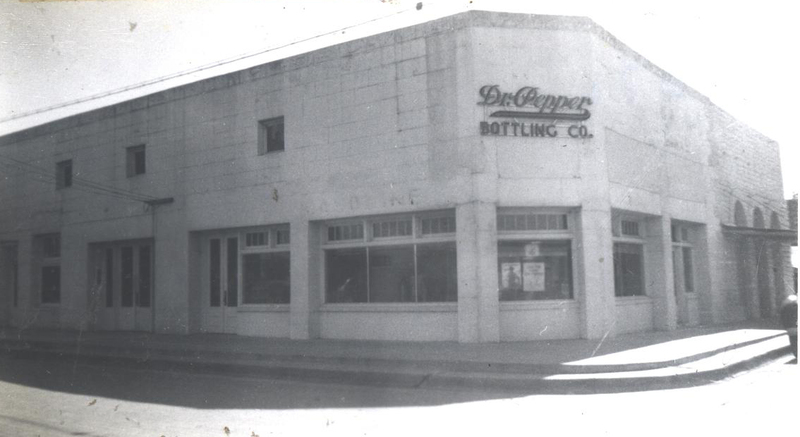 An agreement was worked out between he and Mr. Lazenby and Dublin became America’s first Dr Pepper bottling plant. Then in 1925, because Prim was the first ever to bottle Dr Pepper, he was offered the company’s first bottling franchise. In response to the question of what area he wanted, Prim drew a map on the back of the franchise agreement–Tolar to the northeast, Carbon to the west, Comanche to the south, Lamkin and Fairy to the east and Iredell to the southeast–the same 44 mile radius territory from the Dublin plant as he had picked in 1981. Mr. Prim’s daughter, Grace Prim Lyon, plant heir and operator until her death in June of 1991, later remarked that her father could have taken the Dallas-Fort Worth area or even the entire state had he desired but was satisfied with the arrangement he had originally made with Lazenby. The popularity of Dr Pepper continued to grow as a regional soft drink beverage, but it was at the 1904 World’s State Fair in St. Louis where Lazenby and his son-in-law J. B. O’Hara introduced it to almost 20 million people that it received national recognition. This is the same exposition where hamburgers, hot dogs and ice cream cones were first introduced. Grace Lyons died on the Dublin plant’s 100th anniversary. Having no children or other heirs, she willed the plant to Bill Kloster, who had started working at the plant at age 14 as a bottle sorter for ten-cents an hour. Bill had become plant manager in 1946 after its founder died and Grace inherited it. As the owner, Bill continued to emphasize the same values of service and quality he had learned from the bottler’s founder Sam Houston Prim. He was also committed to continue producing the distinctive taste that would come to be known as “Dublin Dr Pepper,” a taste he was convinced could only be achieved by using cane sugar in its formulation. In 1982 when most U.S. soft drinks, including Dr Pepper, began using high fructose corn syrup due to large price increases and import quotas of sugar, Kloster refused to follow suit. 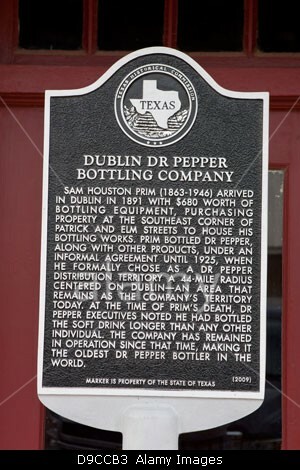 For years the small independent bottling plant in Dublin continued to use the original formula given to Sam Houston Prim which called for Imperial Pure Cane Sugar–the only Texas Dr Pepper bottler to do so. As a result this small bottler with its limited distribution area drew as many as 80,000 visitors annually from around the world, and was continuously among the top ten sales producers in the country. 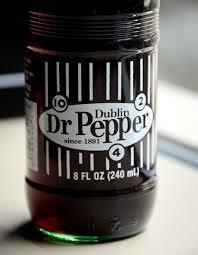 In June of 2011, after an unsuccessful attempt to capitalize on the popularity of Dublin Dr Pepper with their own “Heritage” Dr Pepper made with “Real Sugar” (beet sugar instead of Imperial Pure Cane), the Dr Pepper Snapple Group sued the Dublin bottler for trademark dilution and stealing sales from other Dr Pepper bottlers. The suit demanded that the bottler remove the name “Dublin” from its labels and that it stop selling the soda beyond the 44-mile range around Dublin. In January of 2012, Dr Pepper’s parent company acquired the rights to the six-county territory that had been Dublin Dr Pepper’s franchise, and the bottler stopped producing the soda it had bottled for 120 continuous years. Today, the historic Dublin Bottling Works has reinvented itself without Dr Pepper. Still in operation and managed by the Kloster family, it produces a line of retro soft drinks including Dublin Root Beer, Dublin Cola, Dublin Ginger Ale, and more. And, all of Dublin’s retro soft drinks are made the “right way”–with Imperial Pure Cane sugar.